How do you handle inevitable off the charts shear forces? At the age of 12 a series of medical procedures started for Mr. C as he was diagnosed with epiphysiolysis. This meant that due to an accelerated growth process in puberty a deformation of the hip and hip socket was starting to form. As a result there was also hardly any cartilage left in his hip joints. He underwent a series of surgeries from his 12th year onwards in an attempt to slow down the accelerated growth process. This involved placing and removing metal pins in his hips. Now at the age of 25 his opinion is that the surgeries had divergent effects and that he is still looking for a real solution. The deformity in his hips initially caused Mr. C.’s legs to be positioned outwards (V-shape). In his last surgery doctors attempted to reposition his legs more inwards by vertically cutting one of his femurs. According to Mr. C. this had devastating results causing only more discomfort and he therefore refused further surgery on his other leg. This case mainly revolves around a positioning and stability challenge. His adjusted manual wheelchair is set up to fit the negative anterior wedge in his hips. This in practice means that the seating surface is set up in a downward angle towards the front of the wheelchair. The wheelchair has almost no back support, has a hip belt positioned around the sias, features foam knee blocksand a 3D space fibre cushion that facilitates breathability and microclimate control. The current seating system however lacks stability for the ideal position. Mr. C. needs to reposition every 5 to 10 minutes in order to be comfortable. He feels like he is constantly sliding forward despite his belt, resulting in a lot of pressure on his lower legs just below the knees (on the kneepads). This results in redness of the skin in the knee/lower leg area. He is bothered mostly by the lack of stability when he is actively moving around in his wheelchair and often chooses to keep moving in the uncomfortable position and reposition when he reaches his ‘destination’. Repositioning in itself is a tardy process in which he always needs to release the belt, reposition and fasten the belt. Due to his wheelchair being set in a permanent angle to better fit his fixed hip rotation, there would naturally be a tendency to slide – as in confirmed by Mr. C. in describing his problem. An iShear measurement could therefore provide a lot of insight into the shear forces created by his set up that cause the pressure on his knees. Three different situations were measured with iShear: positioned in the wheelchair without knee blocks or belt; with knee blocks and with knee blocks and belt. iShear shows an off-the-charts measurement of shear forces when Mr. C. is positioned in his wheelchair without any aids. When the knee blocks are applied an overall reduction of 7kg in shear forces is observed. This means that the kneepads hold a force of 3,5kg per knee. Even though the knee pads provide a reduction in shear forces, the amount of force that is left over shows that there must be a significant amount of pressure put on the knee pads. This corresponds with the indication Mr. C. gave about redness of skin in this area. Surprisingly the shear force measurements by iShear show mixed results when the hip belt is applied. Depending on how Mr. C. (re)positions himself the belt can have a positive, negative, or no effect at all on the amount of shear force. Seeing that he repositions himself very often, there’s a chance that he repositions himself into an even worse position (more shear force, more pressure on the pads) and locks this with the belt. In such a “wrong” position the belt forces Mr. C. down his seat even more, increasing the sliding effect down the fixed seating surface. Over the years, Mr. C. had several wheelchairs and cushions in an attempt to better suit his needs and make him more comfortable. None of the changes succeeded in offering a solution to his seating challenge. The current set up was the best achievable result so far. It was obvious that the sliding effect (and thus shear forces) were created by the fixed angle of the wheelchair set up, the inability to immersion into the 3D space fibre cushion only further amplified the situation. The texture of the cushion in place even felt like it would stimulate sliding and create friction. Theoretically speaking this sliding on the fixed, angled seating surface could be decreased or stopped by positioning Mr.C’s IT’s on a flat seating surface. A flat foam piece under his IT’s however feels very hard and uncomfortable. Therefore a different solution was chosen: the combination of a wedge – that would cancel-out the sliding angle – and a Vicair cushion. The image below displays the plan in a simplified way. Keeping in mind Mr. C’s request for stability, the Vicair Vector O2 (6cm) was chosen as the preferred cushion to fix the problem at hand. 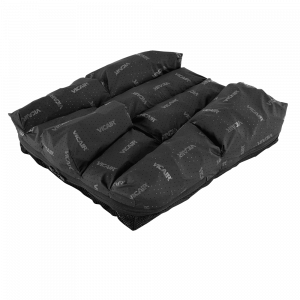 It’s the most stable cushion in the Vicair range and is known for ‘forcing’ people into a correct position. The front compartments of the Vector would also support leg alignment. A foam wedge was placed under the two middle compartments in the back of the Vicair Vector O2. It was fixed into the right position by making use of Velcro in the Vector’s cover. The foam wedge created the flat seating surface under his IT’s where the two SmartCell filled compartments above it would provide the comfort that foam alone couldn’t offer. In addition to changing Mr. C’s wheelchair seat cushion, Vicair knee pads were made to fit his knee blocks. Implementing the SmartCell technology into the knee pads would hopefully redistribute the pressure created by the shear forces on the knee blocks, resulting in less redness and discomfort. Because the Vicair Vector O2 (6cm) was higher than the original 3D space fibre cushion the filling grade was adjusted to facilitate a comfortable position with regards to the distance to the wheels of the chair and manual movement. During the fitting process of the clinical assessment an immediate change was already noticeable. In testing and adjusting his new cushion, Mr. C. no longer felt the need to fasten his hip belt. On top of that he made several test rounds around the facility in his wheelchair and he did not feel the need to reposition. A definitive conclusion about the solution offered could only really be made after a longer period of testing. After two weeks of testing his new set up, Mr. C. indicates that he barely uses his positioning belt anymore. This in itself for him is a great achievement as after previous changes he was never able to do this. Mr. C describes his new Vicair knee pads as being ‘perfect’, he experiences less pressure or better distributed pressure and clearly observes less redness of his knees. Ideally, Mr. C. would like to be positioned a little bit lower for easier reach to the wheels whilst moving around. Despite the reduced amount of cells in the Vector O2, the cushion is still a little bit higher than the old one. Together with Vicair product specialists, Mr. C. is now exploring the options to further optimise his positioning on a Vicair wheelchair cushion. Meanwhile, he is very satisfied with the improvements so far and moves around without any restraints.